Remember the good ol’ days? You know, way back when pa would shear a sheep, the kids would card it and ma would start a spinnin’? Come to think of it, I don’t either, which only proves my point. My point being that that’s why it’s so important to live, learn and love history! In Marion County, history comes alive from centuries ago or even a couple of decades. Pricketts Fort, the name doesn’t say it all. It is a fort, but it’s very much alive. This is a state park and fort with living history interpreters, which means these people live, work and exist a purely 18th Century lifestyle. They tend the gardens, care for animals, cook on the hearth and blacksmith the day away. On top of that, they walk you through every room and show you how they spend their days – just as any 18th Century person would! Just about everything they make is sold in the Trading Post, too. Marion County Historical Society: This one isn’t so much alive as it is undead. The house is filled with portraits, antiques and all kinds of things from generations past. Every room is arranged the way it would have been when the sheriff used to live there with his family. See his kids’ rooms and their non-technological toys. Then, take the passage to the old jail, where you’ll understand why MCHS is more undead than it is alive. Keeping culture alive is the main goal at The West Virginia Folklife Center. Every nationality to come to these hills has been documented and studied, along with their own folklore. Learn how international culture and Appalachia combined for some incredible tales. 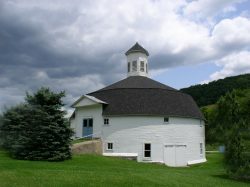 You could try to forget about how technologically advanced Mannington was, but you’d have to face the Hamilton Round Barn. This was the site of the first electric milking machine in the county and one of only a handful of round barns in the state. Never forget where your food used to come from! The museum also keeps alive the memories of early transportation. Wilson School Museum might seem like a typical museum, but take a look out back! Walk through a homey 1870 log cabin restored and furnished with 1870’s decor. Talk about the ultimate interior design challenge! But it’s not just about how they lived, but how they traveled. The Chessie System caboose just outside was built in 1912. And gas stations today are a far cry from the 1900’s South Penn Oil Co. Gasoline Station. Jump into the future at the Telephone Museum. This space is wall-to-wall and floor-to-ceiling with communication techniques over the decades. The tour guides actually worked there in the 1950s with stories of culture, poodle skirts and more! Bluegrass, honky tonk and all that jazz – er, I mean country – is alive and kickin’! Sagebrush Roundup is the country destination of the county with performances both local and renowned. Before the show, explore country through the years at the West Virginia Country Music Hall of Fame. If that’s not enough history for you, I dare you to go through the Civil War Markers in the county. Read through the battles fought and the structures destroyed on the way to the future!